The loss of one or more of your teeth not only affects your appearance but your oral health as well. Tooth loss is mostly due to tooth decay, periodontal disease, or injury. Without a replacement, your remaining teeth may start to shift into the open space, putting you at risk of tooth fractures and damage. Shifting teeth can result in a misaligned bite, causing issues with your jaw joint. When your root is missing, eventually your jawbone will begin to deteriorate, which puts your remaining teeth at risk for further loss. While treatment for missing teeth used to be limited to dental bridges and dentures, dental implants offer patients a new way to restore their smile. Before we dive into the benefits of dental implants, we thought it would be best to go over what they are for patients that may not know. Basically, dental implants are replacement tooth roots. Because dental implants replace both your tooth and your root, it helps protect the integrity of your jawbone and remaining teeth. Dental implants have three parts: a metal implant, an abutment, and a crown. The metal implant is installed below the gum line and is drilled into the jawbone. This anchors the entire implant, much like root anchors would with a natural tooth. The crown replaces the tooth, and the abutment simply holds the crown in place. The crown is custom made to perfectly fit your mouth and look and function just like natural teeth would, making them blend right in. There are several advantages to getting dental implants. 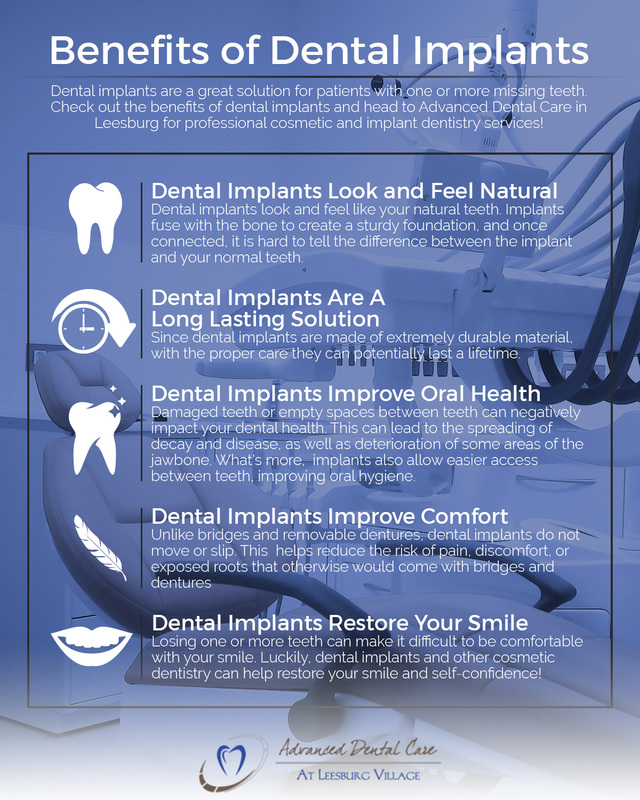 Your Leesburg dental implant dentist can help you decide if they are the best tooth replacement solution for you. A dental implant fuses with the bone so that a sturdy foundation is created. Once the replacement teeth are connected, it is typically difficult to differentiate the replacement teeth from the natural teeth. What’s more, dental implants not only function like normal teeth, but they feel natural too. 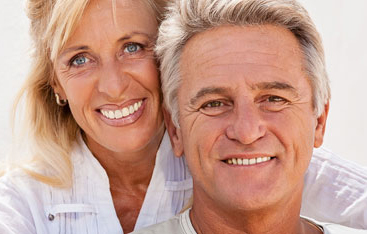 Dental implants provide those who have missing teeth with a long-term solution. Since implants are very durable, with proper care and regular dental exams, implants can potentially last a lifetime. If you don’t get damaged teeth removed or leave an empty space from where the teeth were removed, you can affect your dental health. When teeth are damaged, they can pass their decay and disease along to other parts of the mouth. Similarly, empty spaces between teeth can cause loss or deterioration of some part of the jawbone. 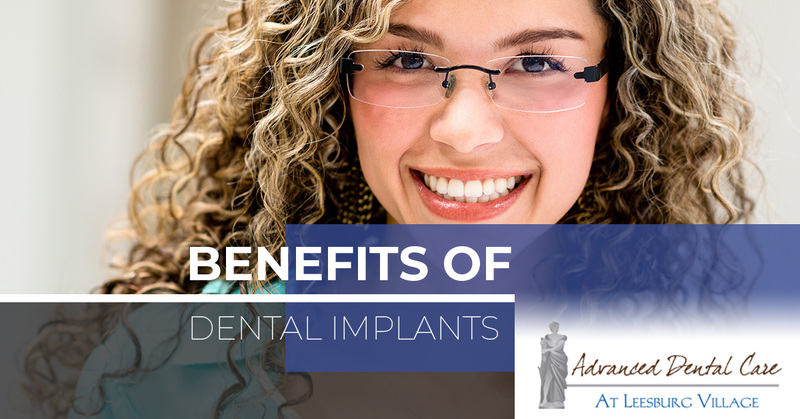 Additionally, implants also allow easier access between teeth, improving oral hygiene. Dental bridges and dentures can often be painful or uncomfortable and a missing tooth exposes sensitive nerve endings. Dental implants replace both the tooth and the root, therefore improving comfort compared to other solutions. Plus, unlike dentures and bridges, dental implants do not move or slip. Losing one or more teeth can make it difficult to be comfortable with your smile. Luckily, dental implants and other cosmetic dentistry can help restore your smile and self-confidence! As you can see, there are plenty of benefits of getting dental implants when you have one or more missing teeth. If you have missing teeth and are interested in learning more about dental implants in Leesburg, contact Advanced Dental Care! 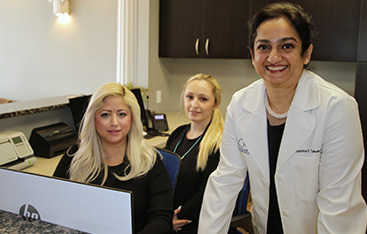 Our team of experienced and knowledgeable dentists specialize in cosmetic dentistry and enhancements to help patients enhance the beauty of their smile. 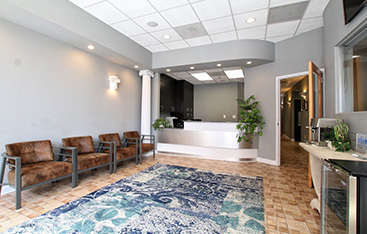 If you are experiencing missing teeth, tooth pain, or other dental issues, schedule an appointment at Advanced Dental Care today!